We like chicken and we enjoy chicken wings, but I wanted something that would taste spectacular, so I thought chicken suya, but how? I already have one recipe here but I wanted something quick with no hassle. I do not know why I never thought about frying chicken for suya. Well, I am sure some foodies may have thought about it, but it never really occurred to me to do it and when I did, I was pleasantly happy. The crunchiness of the chicken with the peppers and the smokiness of the suya spice was epic. Restaurants in Nigeria need to start making suya like this o! 🙂 shuo! Although this is fried, you could grill or bake it in the oven and it would still be amazing. By the time, I did a double take, the chicken was gone. I did not even worry because I really wanted my ajebutters to enjoy it. Heat up some oil to 350 degrees and fry the wings until they golden brown and crispy. You could use a grill or the oven if you prefer. Alternatively, you could season the chicken and toss lightly in flour that has been seasoned with garlic and salt ; then fry or bake for a healthier version. 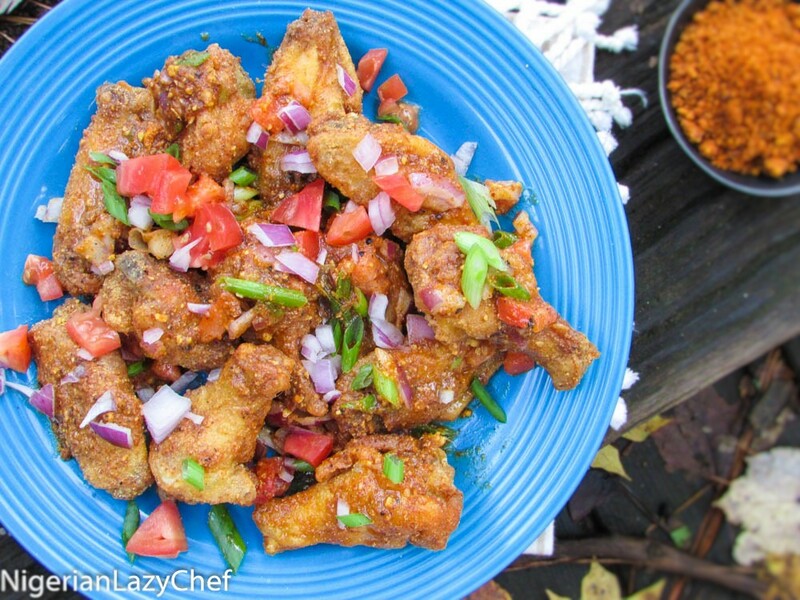 This entry was posted in chicken, chicken dishes, Chicken Recipes, chicken suya, Meat dishes, Nigerian Suya, Small chops, suya, Uncategorized and tagged chicken suya, chicken suya recipe, fried chicken recipe, Fried chicken suya recipe, Nigerian food blog, suya, yaji. my question on this spicy suya wings is d no 6 mode of preparation. are we to toss the suya and oil mix into the oil while frying or after frying d chicken u toss suya and oil mix on it.